These cookies were a happy mistake. I had made them before with just egg whites and they were hard. This time when I went to separate the egg whites I dropped and whole egg in the bowl and just went with it. The result was a soft and chewy cookie with the toasty flavour of almonds and a warm sweetness from the vanilla with a hint a rose. 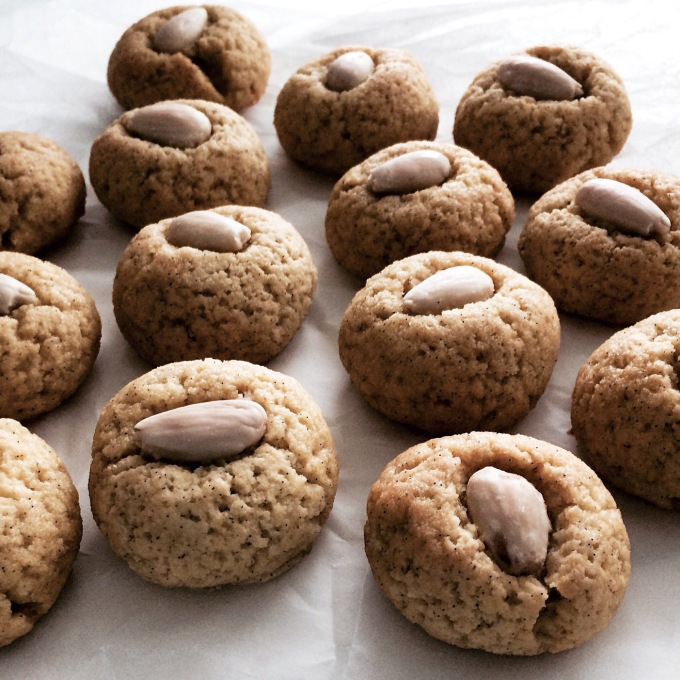 Keeping with my low carb theme, these are low carb and keto friendly, but I have to admit, these are one of my favourite cookies and I will continue making them diet or not. When you have something that is sugar-free but sweet and yummy, it’s a keeper. In a bowl, mix almond flour, xylitol, and vanilla. In a small bowl, place the blanched almonds and cover with rose water. You will also use this rose water for your hands. Wet your hands with rose water and roll the batter into balls. About a tablespoon of batter makes a nice size cookie. Take the almonds from the rose water and press them into the middle of each cookie. I love the aroma and flavour the rose water gives these cookies, but it is optional. If you don’t have vanilla beans, vanilla extract is fine, just use 1 teaspoon. I just love the pretty little specs of vanilla, so it’s worth getting if you can. I make a big batch of these and store them in an airtight container. So whenever I want dessert or something sweet to nibble on they are there.